Elizabeth, Mary, and Sophia Peabody were in many ways our American Brontes. The story of these remarkable sisters — and their central role in shaping the thinking of their day — has never before been fully told. Twenty years in the making, Megan Marshall's monumental biograpy brings the era of creative ferment known as American Romanticism to new life. Elizabeth, the oldest sister, was a mind-on-fire thinker. A powerful influence on the great writers of the era — Emerson, Hawthorne, and Thoreau among them — she also published some of their earliest works. It was Elizabeth who prodded these newly minted Transcendentalists away from Emerson's individualism and toward a greater connection to others. Mary was a determined and passionate reformer who finally found her soul mate in the great educator Horace Mann. The frail Sophia was a painter who won the admiration of the preeminent society artists of the day. She married Nathaniel Hawthorne — but not before Hawthorne threw the delicate dynamics among the sisters into disarray. Marshall focuses on the moment when the Peabody sisters made their indelible mark on history. Her unprecedented research into these lives uncovered thousands of letters never read before as well as other previously unmined original sources. The Peabody Sisters casts new light on a legendary American era. Its publication is destined to become an event in American biography. This book is highly recommended for students and reading groups interested in American history, American literature, and women's studies. It is a wonderful look into 19th-century life. MEGAN MARSHALL is the winner of the 2014 Pulitzer Prize in Biography for Margaret Fuller, and the author of The Peabody Sisters, which won the Francis Parkman Prize, the Mark Lynton History Prize, and was a finalist for the Pulitzer Prize in 2006. She is the Charles Wesley Emerson College Professor and teaches narrative nonfiction and the art of archival research in the MFA program at Emerson College. For more, visit www.meganmarshallauthor.com. Many prominent women of the nineteenth century were raised by strong-willed fathers who gave their daughters a “boy’s education.” The Peabody sisters were different: it was their mother who was their most profound intellectual influence. Discuss the relationship between Eliza Palmer Peabody and her daughters, the strengths she offered as a mother, as well as areas of conflict. What might have been the effects of having a strong mother as a role model, rather than a father who insisted that a talented girl was “exceptional” or had a “man’s mind”? The Peabody sisters were women of ambition and talent living in a time of restricted opportunity for women. They could not go to college, and teaching was the only profession easily available. Discuss the ways each of the sisters coped with restrictions and did or did not make use of her own personal power. 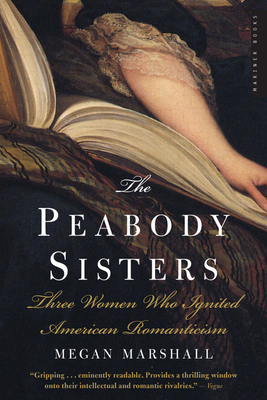 The three Peabody sisters were “linked in heart, in opinions, and in talents,” according to their mother, yet as in all threesomes there were periods of stress when alliances formed or shifted. Identify several key moments when alliances among the sisters shifted and discuss the meaning of those times for each sister. Birth order has a significant impact on personal development. How did birth order affect all six Peabody children? Were the Peabody brothers fated to live lives of relative insignificance, or were other, more significant factors at work, such as the era of economic turmoil in which they came of age? Elizabeth Peabody and Margaret Fuller both held classes, or “conversations,” for women in which members studied world history or Greek mythology, among other academic subjects. These classes provided significant opportunities for women to discuss larger issues as well. Fuller asked in class, “What were women born to do?” Elizabeth Peabody’s class deliberated over “the meaning of life,” and concluded that women must cultivate an innate spirituality, but also find ways to act for the betterment of society. These are large questions, and no less relevant today. What important questions would you want to pose in your group? Consider the classroom that Elizabeth Peabody and Bronson Alcott created for the Temple School. Which of their progressive methods have been adopted by the mainstream? What would be the elements of your ideal classroom? Transcendentalism has been notoriously hard to define, perhaps because it was essentially a movement that empowered individuals to seek their own answers to fundamental questions. Discuss the three strands of transcendentalism that emerge in the book: the cultivation of an inner life and a personal spirituality; the “social principle” that Elizabeth Peabody defined as an impulse to do good for others; and nature as revelation of an overarching spirit alive in the world. Were all three sisters transcendentalists? Were Nathaniel Hawthorne and Horace Mann transcendentalists, even though they sometimes disparaged their idealistic peers? There are several triangular relationships in the book besides that of the three Peabody sisters. How would you sort out the romantic entanglements of Horace Mann with Mary and Elizabeth Peabody, and Nathaniel Hawthorne with Elizabeth and Sophia? What did Elizabeth want from her relationships with these men, and was she really the loser when her sisters married them? The Channing brothers, Rev. William Ellery Channing and Dr. Walter Channing, played powerful roles in the lives of Elizabeth and Sophia Peabody. Was Elizabeth’s relationship with Rev. Channing one of mentorship or mutual influence, or both? Compare Sophia’s relationship with Dr. Walter Channing to a psychotherapeutic relationship today.